In previous lesson, we have learned to write code associated with the worksheet object in Excel VBA . In this lesson, we shall learn about the Workbook object . 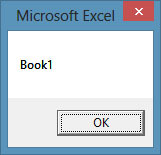 The Workbook object at the top of the hierarchy of the Excel VBA objects. We will deal with properties and methods associated the Workbook object. The output is shown in Figure 21.3. There are a number of methods associated with the workbook object. These methods are Save, SaveAs, Open, Close and more. 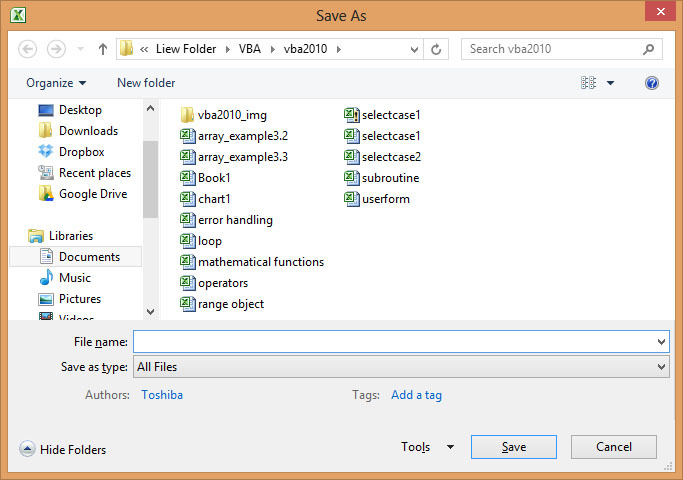 In this example, when the user clicks on the command button, it will open up a dialog box and ask the user to specify a path and type in the file name, and then click the save button, not unlike the standard windows SaveAs dialog, as shown in Figure 21.4. In this example, when the user clicks the command button, it will close Workbooks (1).